Alkane Truck Company’s Liquid Propane Autogas Powered Class 7 is the first in its class to be designed from the ground up, and front-to-back to run on LPG. Available in 26,000 and 33,000 GVW classes this cab over is the perfect inter-city solution. The cab over design helps with visibility while negotiating in tight areas and the hi-torque engine runs extremely quiet without any black smoke. 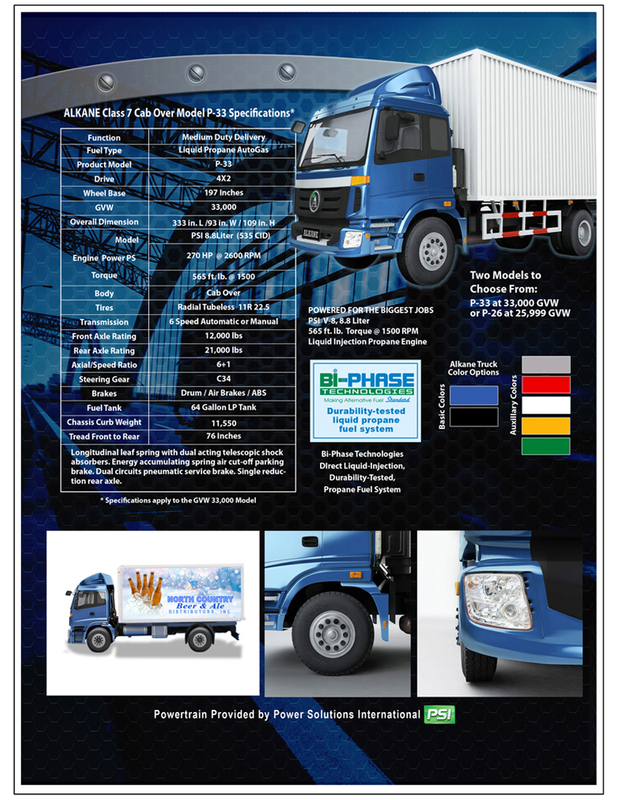 The Alkane Liquid Propane Autogas Powered Class 7 Cab-Over truck comes equipped with a Power Solutions International (PSI) 8.8 Liter big block engine with a durability-tested Bi-Phase Technologies Liquid Propane Autogas or Compressed Natural Gas fuel system and is complemented by the Allison 2500 series heavy duty automatic transmission. Due to less carbon build-up and friction, natural gas powered engines generally surpass the life cycle of their gasoline and diesel counterparts. The Liquid Propane Autogas Powered Class 7 cab over cleared D. O. T. certification in November 2015 and will be available for distribution in early 2016. Alkane Truck Company utilizes a unique manufacturing model that reduces costs and turn time between order and delivery. Reduced time and manufacturing costs affords the company the ability to sell the Alkane Truck Company’s Liquid Propane Autogas (LPG) Powered Class 7 for a comparable price to its diesel counterpart. Better efficiency, cheaper fuel costs, longer lasting engines, and local, state, and federal, purchase incentives make buying these LPG powered vehicles extremely attractive. Liquid Propane Autogas (LPG) distribution exceed that of any other alternative fuel. for larger fleet operators the cost of installing a fueling system at their terminal(s) is far less than the cost for diesel and gasoline fueling facilities. Operators should keep an eye on local, state, and federal incentive programs to offset installation costs. 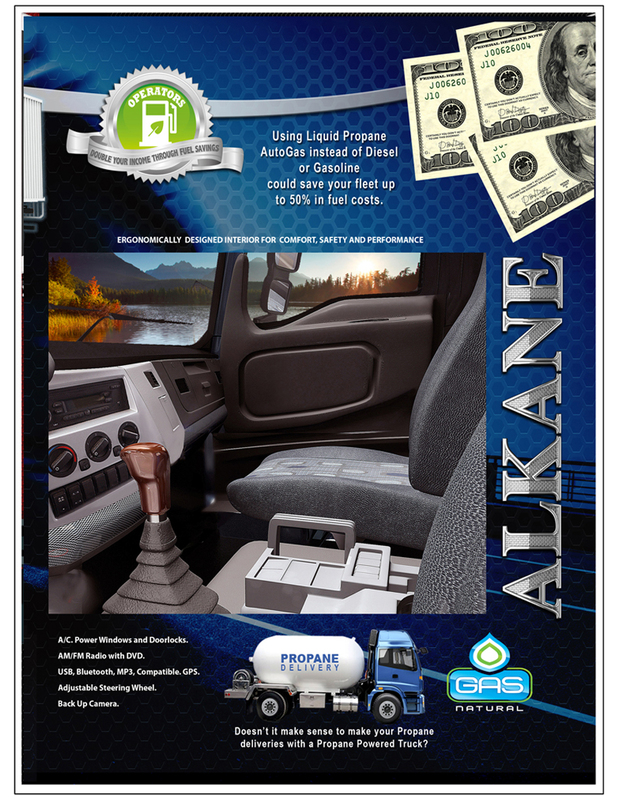 Keep up with the latest news about the Alkane Truck Company’s Liquid Propane Auto-gas Powered Class 7 and other vehicles by subscribing to receive our updates via email. Follow us on Twitter and Facebook.